That is so scary! I wouldnt want THAT running loose in my neighborhood!!! omg there are wierd animals everywhere lately!! my neighbor just got a pet pig, which is reely wierd because i dont livee in a rural area or even a suberb! could be a were, i dunno but that is so terribly odd. no one knows anymore, the gov hides so much. 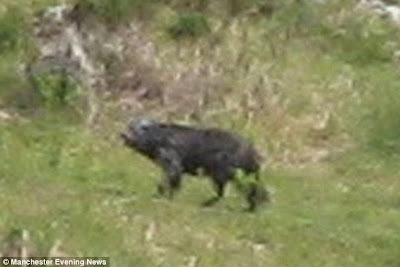 It looks like a boar to me. I agree with very_irregular_girl: this is probably a government mutation (like the jabberjays in the Hunger Games) designed to get rid of some people who are too much trouble for the goverment officials. Or do something else. Or, maybe its just a regular animal that was either really like that or Photoshopped. Not sure what it is but it looks scary. There were recent reports og a bearcat around here. I think it's a hoax. But I don't believe it's the gov, since I don't think technology's at that point yet, but it's getting there . . . Anybody see Joshua Bell/Renee Fleming/Sting/Dead Composer last night? It's probably some kid named Marco having a bad day and unable to control his morphing powers. He tried to morph a boar but he messed up and ended up morphing half a boar, half a cat. Jokes aside, I have to wonder: assuming this is real, what will be done with the animal? easy its a cross bread of boar and panther! Kiki: OMG! i thought of the hunger games as well as soon as i saw this post! love. love love those books! of course, not as much as i love the kiki strike books...no one beats kiki, not even katniss! totally weird!! lots of crazy odd animals lately........ i think it looks like a boar, but i can't be sure. it's probably just a mutation or something. but still.... freaky! btw, check my blog out!